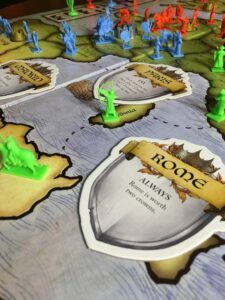 RISK Europe let’s you play a campaign style RISK game where you travel from country to country in a medieval setting and handle challenging situations in the way that medieval rulers would have handled them. 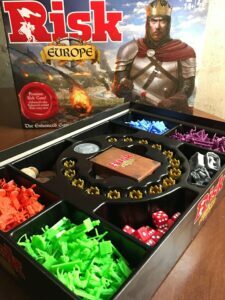 If you are a RISK board game enthusiast, you would then most likely enjoy playing Risk: Europe. 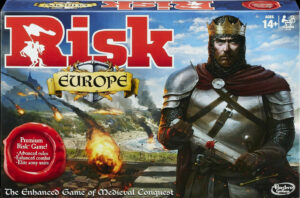 The theme of this RISK game is simple; if you control the crowns of medieval Europe then you will control the continent. You will step into the role of a King or Queen and rule rule feudal Europe by way of building castles, taxing citizens, expanding your territory and winning battles. 4 Reminder Cards, 8 Crown Cards, a Card Box and a Game Guide. 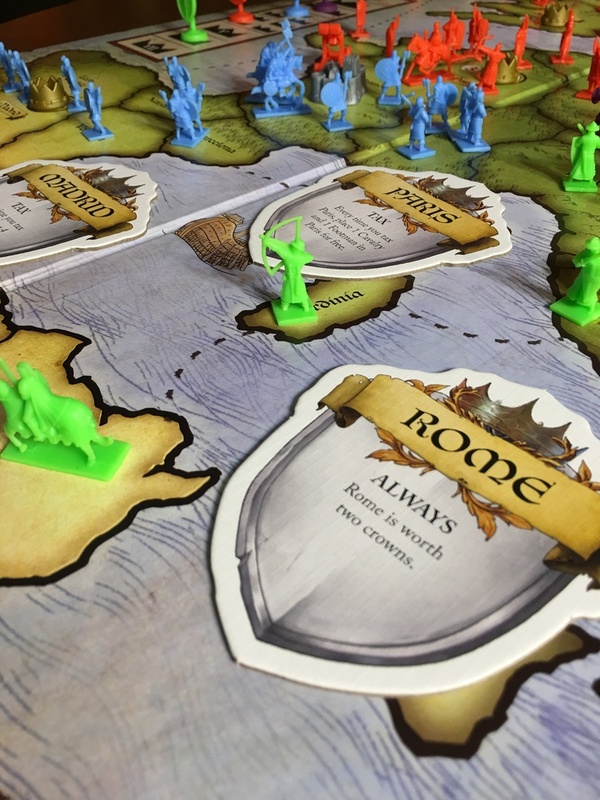 The main object of playing Risk Europe is to conquer 7 Kingdoms, with the most likely scenarios that include you winning at least 5 Golden Crowns (which are Victory Points) as part of a combination. There are 2 ways to achieve this. If you control a city or obtain Crown Cards, which are valued at 1 Victory Point each, then victory is within your grasp. To control a city you must have a troop occupying it, and you will receive income when you first claim it. You will then place a Golden Crown on that claimed city. Around half of the 15 cities on the Risk: Europe game board have a special ability, which never change from game to game. There are 2 game modes to choose from when playing Risk: Europe. The first mode is the Basic Game where the Crown Cards are worth 1 Victory Point each. These cards can only be bought with money and they have no special abilities. Players can buy as many Crown Cards as they want, but only 1 card per round for each player can be bought. The other mode is the Advanced Game where the Crown Cards are still worth 1 Victory Point each, but in this mode players have to earn these cards by meeting specific preconditions. The special abilities that come with these cards will never be stolen by opposing players, which are different than a city’s special abilities. Each player will receive 8 King’s Orders Cards. Each of these cards will present 2 options to players. The 8 cards are not shuffled at any point because they will all be put in play. These cards contain not faction abilities, unlike the original game of Risk. 2 of these 8 cards will be selected for every round and they will be placed in a single stack down on the table. The other 6 cards are set aside for later. Once all players do this the round will officially begin with the player who has the First Player Marker. In clockwise order players will take their turns by flipping their top card and perform what is indicated on that card. Next the players flip over their bottom card and perform what is indicated on that card. There are 2 actions to choose from on each card. A new round begins when all actions involving combat are taken. Everyone secretly chooses 2 more King’s Orders Cards but only from the remaining 6 cards that they have. After using all 8 cards in the first 4 rounds, they are picked up again for the 5th round and onward. Combat doesn’t commence whenever troops are moved into a territory. Combat zones that are formed during a round are all resolved at the round’s end. Players will have 4 different types of troops to command. Each troop carries their own special abilities. Non-footmen troops are more expensive to buy but are better for striking first at combat. The Siege Weapons that players have at their disposal are very powerful and offer a special attack via one of the King’s Orders Cards. Castles can be built on any map space. Castle spaces can only be attacked by any enemy that has a Siege Weapon. Any other form of attack on a castle is illegal. Combat is made up of multiple dice-rolling rounds. Special troops always fire first in every round before the normal Risk battles of 3 vs. 2 dice rolls occur. Once combat commences neither army involved is allowed to retreat from that battle, so players are guaranteed to either win or lose. This mechanic adds to the importance of a player implementing his or her strategy before battle. They must be careful and weigh out the costs of a potential battle. This is why Risk: Europe includes elements such as making treaties, forming alliances and general negotiating. Special abilities have an impact on the decisions that players will make throughout the game, and this is particularly true with the special abilities that Golden Cities contain. One example of this is that cities on the eastern or western part of the map can deploy free troops whenever one player collects taxes. The one thing to be concerned about if you are the tax-collecting player is whether or not you will have enough troops of your own to stop an opposing player’s attack from being successful. If a player controls a few key spots on the map where tax-collecting is very beneficial, that player becomes a massive threat to other players. Risk: Europe is a game recommended for players who are more experienced at playing the original Risk board game and its variants. This version of Risk game can be played by 2 to 4 players of the ages 14 and up. A game of Risk: Europe normally takes around 60 to 90 minutes to complete. A welcome addition to the family of Risk board games, Risk: Europe provides its own fresh spin on Risk combat. While the presence of dice-rolling battles remains, the additional features of choosing actions on cards, making treaties, forming alliances and negotiating with opponents all provide extra dynamics to account for. 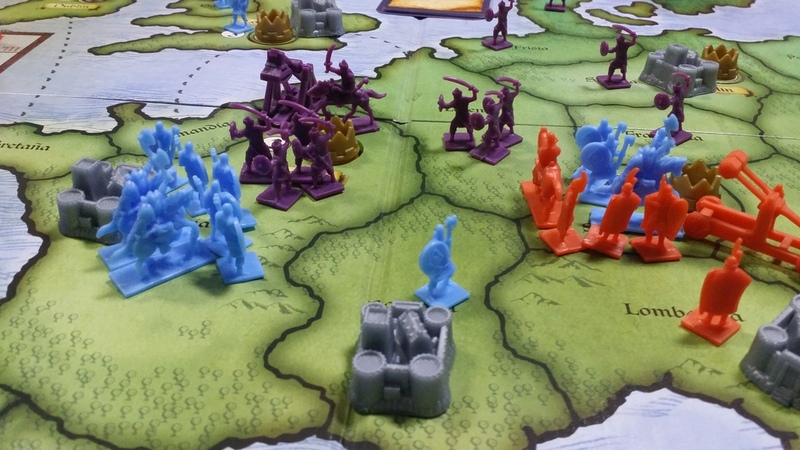 Players who have enjoyed the original game of Risk will take some time adjusting to Risk: Europe, but they will quickly learn to appreciate the additional strategic elements. 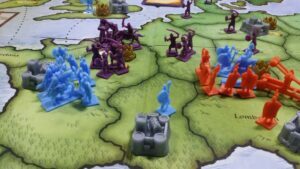 The most thrilling points of Risk: Europe emerge whenever one player gets closer to the goal of winning 7 Golden Crowns because actions will become more calculated. 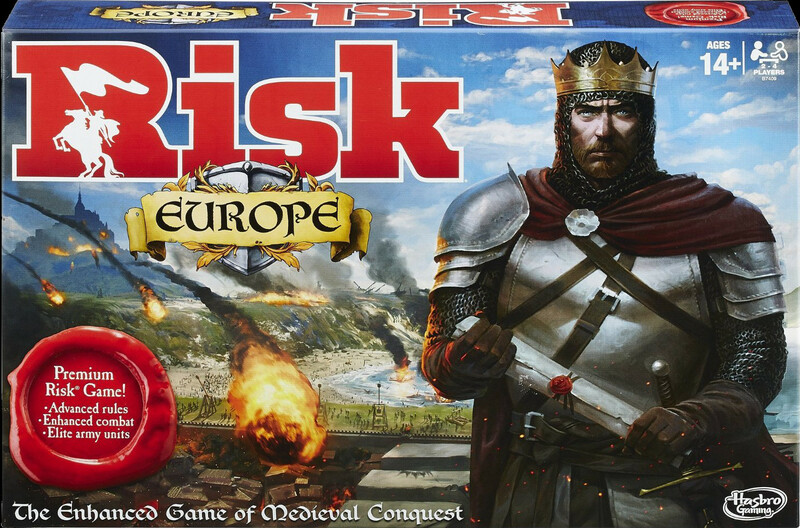 Risk: Europe is a variant that avid Risk players must own.